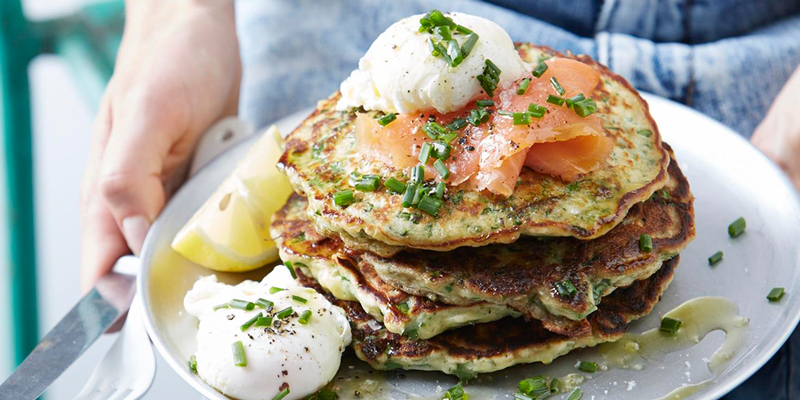 These savoury pancakes are the answer to your weekend breakfast dilemma. Filled with green veggies and sans refined sugar, they won’t leave you feeling stodgy for the rest of the day like the sweet originals do. 1 cup plain flour (gluten-free plain flour if you prefer). 100 g smoked trout to serve (optional). 1. In a large mixing bowl, combine flour, baking powder, salt and pepper. Set aside. 3. Heat a large frying pan on medium-high heat. Add a little butter to coat the pan. When pan is hot, scoop ½ cup mixture for each pancake and flatten out until 1cm thick. Cook for a few minutes until bottom is golden brown, flip and cook on the other side. Cooking time will be about 4-5 minutes per pancake. Place into a pre-heated oven to keep warm while making the remaining pancakes if you like. 5. Divide the pancakes amongst two plates. Top with poached egg, trout and garnish with chives.